Notice anything new here? I gave my blog a makeover. I have a few tweaks to do, but I am pretty happy with the new look. It looks like Spring. 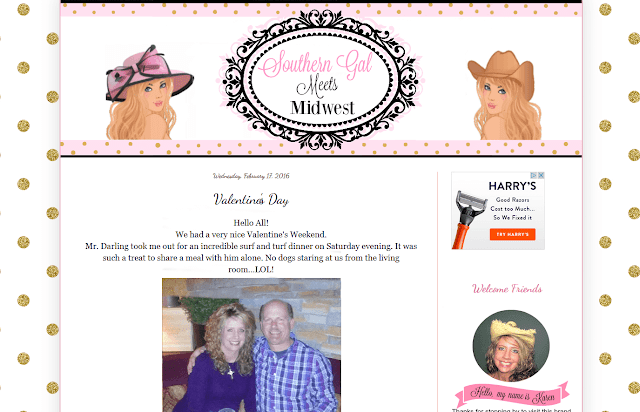 Speaking of makeovers, I also wanted to share Karen's blog, A Southern Gal Meets Midwest. She contacted me for a spiffy new look. I hope you stop by and say hello. Lemon yellow and pink, what's not to love? Yellow placemats with my Bee plates from Horchow. A pretty pink bunny plate sits upon the yellow plate. I topped them off with a small pink and white rose plate. 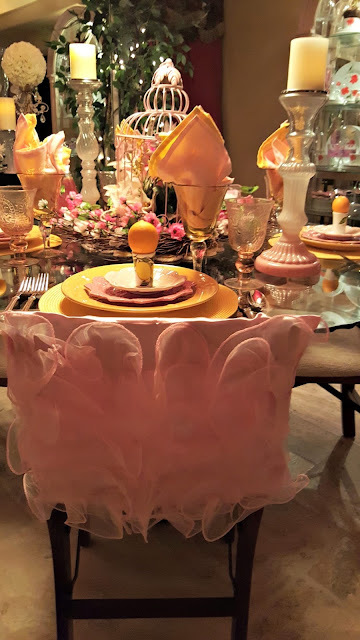 It feels like Spring here, so I was motivated to create a fun spring tablescape. Love the colors yellow and pink together, so named it Pink Lemonade. The pink bird cage ties in with the Spring look. I am ready for Spring! Frilly pink chair covers our folding chairs. Maybe one day, I will be motivated to sew some larger chair covers for the Breakfast room. Lemons are from our tree. I have them sitting in small limoncello cups. Speaking of Limoncello, my husband is making some. It's time to add the simple syrup. What a beautiful tablescape! Love the title of pink lemonade. Everything speaks of spring. The colors of your plate stack are gorgeous and the chair covers are so lovely. Very pretty centerpiece. Your header is very attractively designed. Your photos are breath taking and surely you are very creative. You have a beautiful place to live in. Very enchanting indeed. 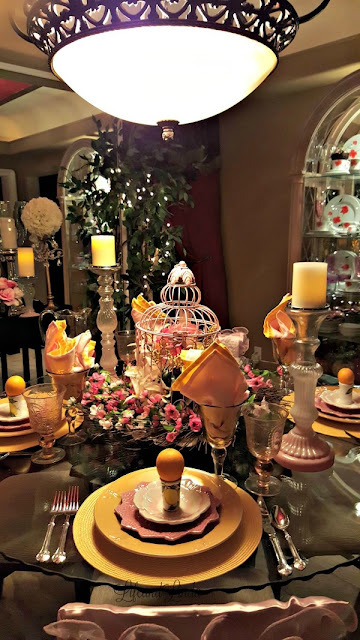 Your updated blog looks so pretty, Linda, and your table shouts of Springtime! The centerpiece with the birdhouse surrounded by the flowered twig wreath is perfect! How nice that you have your own lemons from your tree. Oh yes I noticed right away your new welcome Spring look! I love it, but you know me I am partial to pink. I adore your Spring table and the title is perfectly wonderful! Oh my goodness, Linda, you have me jumping into Spring and I'm so ready! Your new blog design is gorgeous - love PINK!! Absolutely Adorable. You and the Table! How utterly BEAUTIFUL, Linda! I have several birdcages & never once thought to put one inside a wreath & use it for a centerpiece. Brilliant! I never think to combine pink & yellow either but what a refreshing, Spring-like feeling. Just delightful!! I love your lemon inserts throughout! How pretty...I've always loved pink and yellow or pink and lime green. Your chair covers are so perfect for your feminine tablescape! Ahh love the spring coloring! The centerpiece is so cute and of course I love the dishes. 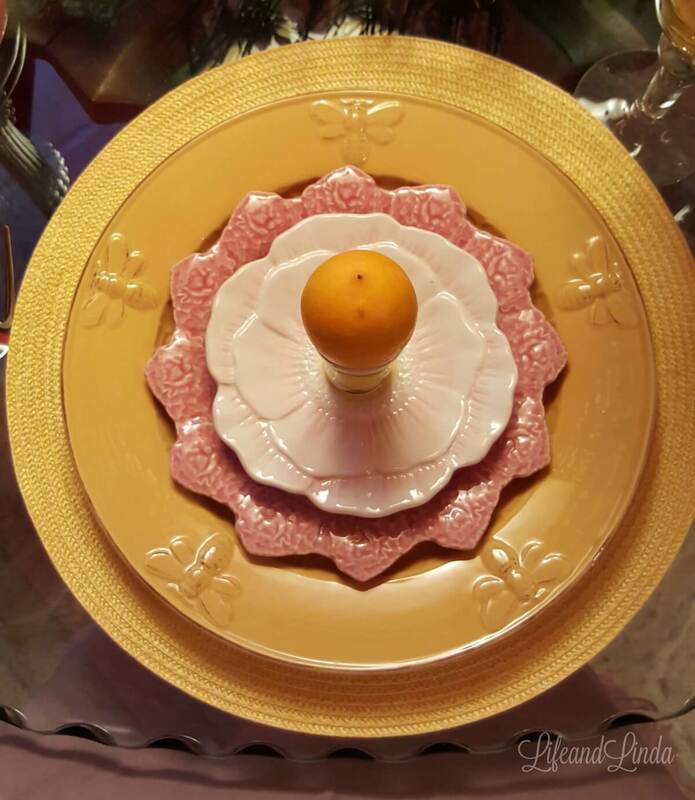 I like that pink plate mixed with the yellow- great combo! You make me want a new spring look on my blog!! Hey Linda, your new blog layout looks wonderful!!!! And that pink lemonade theme is very refreshing. BEAUTIFUL, as always! Both your blog and your tablescape look lovely. Thank you for joining TOHOT. We are so glad you are here. Linda, I do love the spring look of your blog...it looks really good!! You are one talented chick! :-) And that table...oh my goodness...how awesome!! I have a great recipe tucked somewhere for little lemon souffles...baked in the lemon rind. I think it was a Martha Stewart recipe! Hugs!! Your table makes me smile...spring seems to be in the air, here, too. Until recently I never put pink and yellow together, now I do every chance I get. Nice blog makeover! Love those bee plates! Hi Linda! First of all, your blog looks beautiful. Love your new header and you are so good at this. Your table is gorgeous! The yellow and pink are so pretty together. 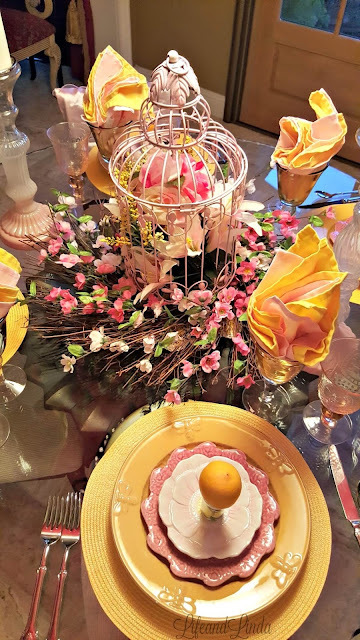 The birdcage centerpiece is lovely and those chair covers! Divine! Thanks for popping in to see me. So beautiful and just perfect for spring! You are the Queen of Tablescapes! I noticed the blog update immediately ~ love it too. 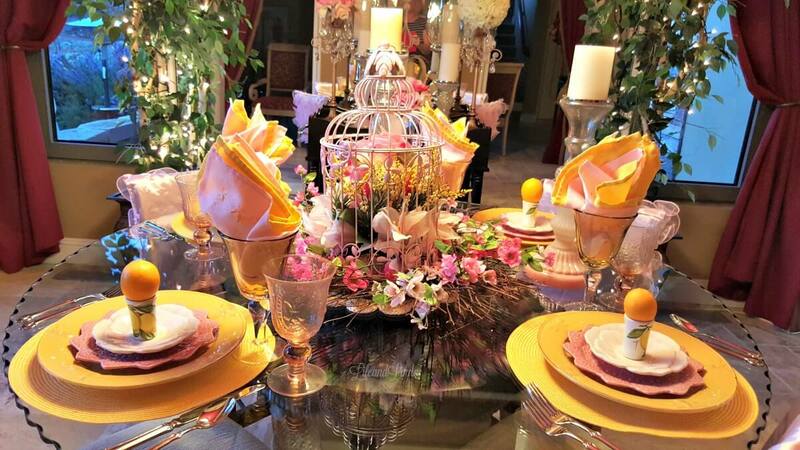 How adorable, your centerpiece is fabulous, and love the frilly chair backs! I did notice your makeover, Linda, and word is that you are wonderful in helping others do the same. I'll visit your friend--I'm in the Midwest, too. Beautiful table and darling title. Thanks for the inspiration! What a happy color combination! I adore the centerpiece. I am a bit late in visiting due to it being college finals week for me but I am so very happy you joined Thought of Home on Thursday and shared this delightful gem. You set the most beautiful tables and this is another one for sure. I love this color combo for spring too! Love the bee plates, so pretty. 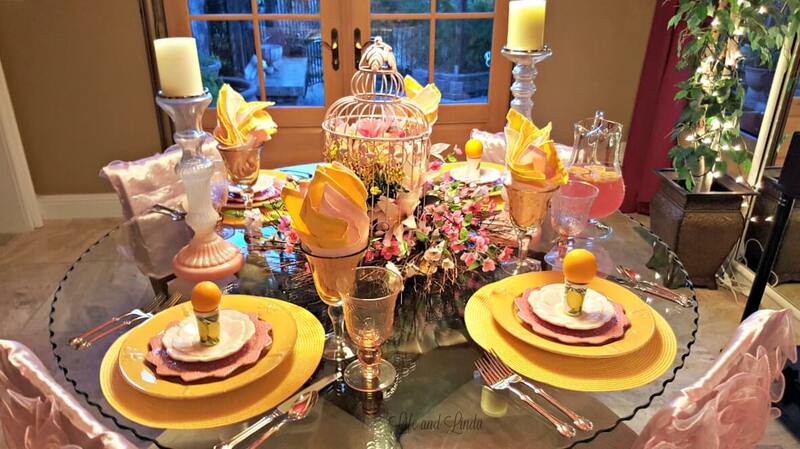 Your tablescape is so pretty....love the pink and yellow together! Linda your header is terrific, love it! Your tabledscapes are always awesome too. Pink and yellow is so pretty together and screams S-P-R-I-N-G! !